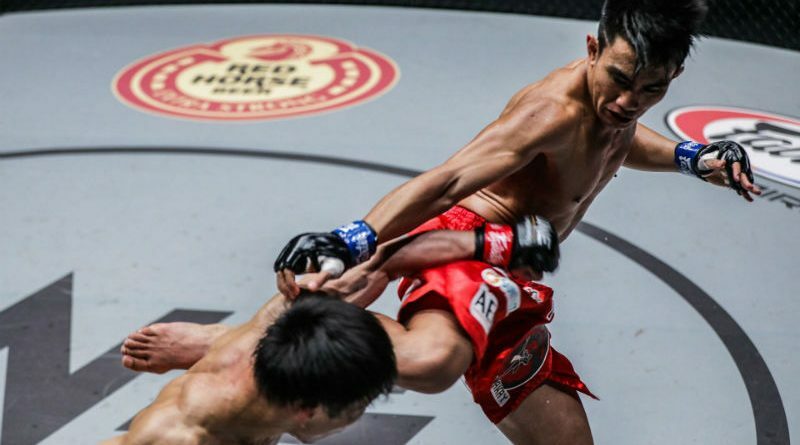 Joshua Pacio claims back his belt while Edward Kelly is back at the win column when they dispatched their respective opponents by knockouts during ONE: ROOTS OF HONOR last Friday, April 12, at the Mall of Asia Arena. Pacio scored an outstanding fourth-round knockout against reigning titleholder Yosuke “The Ninja” Saruta to take back possession of the ONE Strawweight World Championship. He lost the title to Saruta via razor-thin split decision last January. Pacio connected a head kick that sent his Japanese adversary face first to the canvas, forcing the referee to immediately jump in and wave off the contest at 2:43 of round four. Kelly, on the other hand, retired Sung Jong Lee by unloading a barrage of strikes in the second round that rendered Lee unable to defend or retaliate, forcing the referee to call an end to the bout at 2:51 of the round. Kelly improved his record to 12-6 and maintained his 100% finishing rate in his fights under the ONE banner. 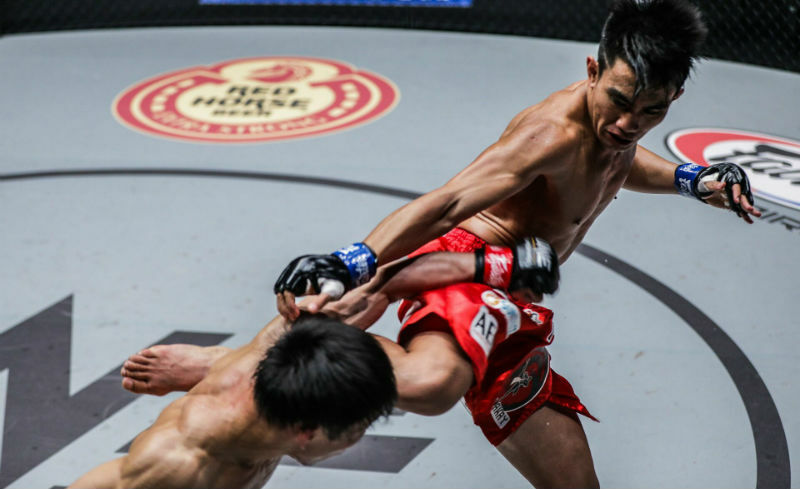 The fights of other Filipinos in the event garnered mixed results as Eric Kelly, Edward’s brother, was finished in just 19 seconds while Ramon Gonzales destroyed his rival in 79 seconds. “Pretty Boy” Kwon Won Il unleashed a perfectly-timed straight right hand to Kelly’s chin and sent him crashing to the canvas, 16 seconds into the fight. Kwon followed him to the mat with a barrage of punches and hammer fists, forcing the referee to wave off the contest before any further damage to Kelly will be inflicted. Gonzales was granted the opportunity to open the event and he did kick off the night with a bang for the hometown crowd. The 31-year-old handed Akihiro “Superjap” Fujisawa the first defeat of his career as “The Bicolano” forced Fujisawa to tap to a guillotine choke at 1:19 of Round One. Tatsumitsu Wada defeats Gustavo Balart via unanimous decision in a ONE Flyweight World Grand Prix quarter-final bout. James Nakashima defeats Luis Santos via TKO at 0:56 of round two of a mixed martial arts – welterweight bout. Anderson Silva defeats Andre Meunier via knockout at 1:14 round one in a ONE Super Series kickboxing – heavyweight bout. Saemapetch Fairtex defeats Ognjen Topic via majority decision in a ONE Super Series Muay Thai – bantamweight. 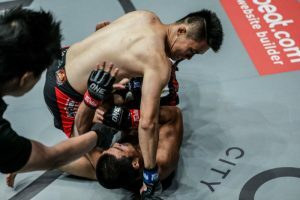 Xie Bin defeats Ahmad Qais Jasoor via submission (D’Arce choke) at 2:27 of round two in a mixed martial arts – bantamweight bout. 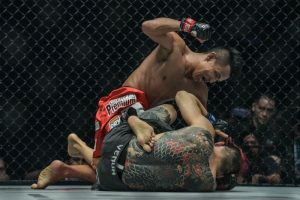 Niko Soe defeats Eko Roni Saputra via TKO (doctor stoppage) at 3:03 of round one of mixed martial arts – flyweight bout. Lerdsila Phuket Top Team defeats Kohei “Momotaro” Kodera via unanimous decision in a ONE Super Series Muay Thai – flyweight bout. Bi Nguyen defeats Dwi Ani Retno Wulan via TKO at 3:55 of round one in a mixed martial arts – women’s atomweight bout.